Toyota President Akio Toyoda (left) and Panasonic President Kazuhiro Tsuga at a joint news conference in Tokyo. TOKYO -- Toyota Motor and Panasonic are considering jointly developing batteries for electric vehicles, a partnership that could help Toyota in its bid to build EVs and Panasonic in its efforts to extend its market lead in automotive lithium ion batteries. The two companies signed an agreement Wednesday aimed at addressing growing demand and expectations for electrified vehicles, Toyota said in a statement. The goal is to make the best prismatic battery -- rectangular in shape as opposed to cylindrical -- and ultimately contribute to the popularization of Toyota’s electric cars and those of others, it said. 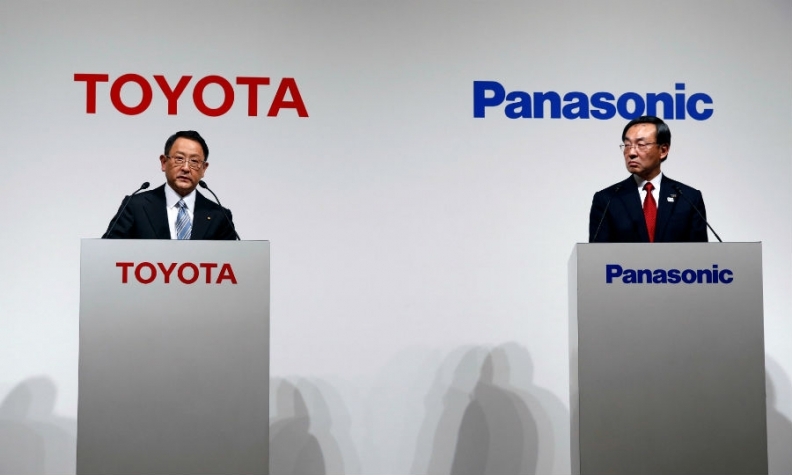 The partnership would build on an existing agreement under which Panasonic manufactures batteries for Toyota's hybrid and plug-in hybrid vehicles. Toyota said last year it planned to add fully electric vehicles to its product lineup in a shift away from its previous green-car strategy of focusing on plug-in hybrid and fuel-cell vehicles. The automaker launched a venture with Mazda and affiliate-supplier Denso in September to accelerate development of EV parts for use across a spectrum of models. Toyota plans to introduce electric models by 2020 in China and India, where its partnering with Suzuki Motor. Panasonic is the world’s largest supplier of electric-car batteries and the main EV battery supplier for U.S. automaker Tesla. The company commands 29 percent of the market for batteries used in plug-in hybrids and EVs, according to Nomura Research data for the first half of 2017. Nearest rival LG Chem holds 13 percent of the market, followed by China's BYD on 10 percent and Contemporary Amperex Technology at 9 percent. Panasonic and Toyota have also had a joint venture since 1996 called Primearth EV Energy Co., which makes lithium-ion and nickel-metal hydride batteries for other Toyota cars. Toyota controls 80.5 percent of the entity, with Panasonic owning the remainder. "Working with automakers from the initial stages could allow battery makers to win orders that unlock economies of scale further down the road," Credit Suisse analyst Mika Nishimura said in a research note to clients ahead of the Toyota Panasonic announcement. "Partnerships could also allow battery makers to share r&d and capex costs with automakers to some extent." Panasonic sees batteries as central to its plan to nearly double automotive business revenue to 2.5 trillion yen ($22.05 billion) by the year through March 2022. To that end, it has been expanding battery production capacity globally. The battery producer started mass production of battery cells at Tesla's "Gigafactory" in the U.S. state of Nevada earlier this year and plans to follow suit at a new plant in Dalian, China. It is also adding new production lines in Japan. Separately, Toyota is also pouring resources into the development of a solid-state battery that it aims to have in electric vehicles by the early 2020s. Solid-state batteries promise to offer shorter charging times and longer driving ranges as well as being safer than the current generation of lithium-ion cells.